Magento extensions are developed to customise the online shops in accordance with the changing needs of both the merchants and customers. It enhances your website by adding extra features, to ensure better shopping experience of your clients. Browse our catalogue of Magento extension, developed by our experienced developer, to find out the extension that is most suitable for your e-store and help you customise your website. Our extensions strive to narrow down the difficulties faced by online merchants and customers while browsing products. Now it’s quite easy to add any type of extra fees into any of the products available online for sale! Yes, this can now be done through Order – Extra Fees Magento Extension – especially meant to offer this functionality to your e-store. Now you can add at any level, anytime and on any product that extra fees, to magento-powered ecommerce sites. This extension manages the pre-defined extra charges by the admin from backend and only the amount is displayed in the frontend. You can now add new features to offer more functionality to your store and enhanced shopping experience to your online customers! We, at Biztech Consultancy, has rolled out Advanced Shop by Brand that will enable you upload the brand logos of the products on sale. Managing brand logos of your products from the admin side has never been so easy. These logos can be integrated effortlessly with your online store. Magento, undoubtedly, is the best open source e-commerce solution around. The number of features and functionalities it offers is simply amazing. The default functionality of magento allows customers to review and write feedback about your products. However, with the dynamic Magento Feedback Extension from Biztech Consultancy, your customers will be able to do a bit more! Well, with our magento extension your customers can offer feedback for your entire magento e-commerce website in the easiest manner. Product review is important for most of the customers as it allows them to make better purchase decisions. But what if customers can get feedback about an entire magento store? This certainly helps save their valuable time. This easy-to-use Magento Feedback Extension has been specially carved out for customers to write feedback about an entire magento website. What’s more, as an admin, you have complete control over the feedback displayed about your magento store. The magento feedback extension can be easily managed from the back-end admin panel. It has been optimized to deliver consistent performance across multiple platforms. Our “Track Order” Extension allows the buyers to check the status of their orders without logging in to their account. Customer can also check the tracking information of shipment using this extension. A link called “Track Order” will be automatically inserted in the header part of the site. The customer (buyer) will simply have to fill the order number and email address, and they will be shown the order status with all its details including the shipment tracking information. The details will include links to shipment provider’s site to track order directly. It is a best selling language translator extension from Biztech and is available for both Magento and Magento 2. With this extension you can translate product details, category details, CMS pages content, product reviews, search strings, etc either one by one or all in one go. With Biztech’s Language Translator extension for Magento, expand your customer base by translating any portion of your store content into multiple languages. It helps you manage your multi-lingual store more efficiently. Convert CMS page details like Page Title, Content Heading, Content and Meta Details in any language. Convert Category fields into any language for you e-commerce store. Search and translate any string of the store. Admin can save lot of time for translation by translating multiple items of the product page through Mass Translation provided by Language Translator. Translate reviews from one language to another. Uses Google Translate API key to translate the data. Admin can search for a specific string and translate it to any language. You can optimize the category pages, Product pages and CMS page for a particular product or group of products with this extension. This can lead you obtain higher position in the various search engines. Mobile Assistant allows online merchants to view all the details of their online store on their iOS devices (iPhone, iPad or iPod). The extension helps store owners to view stores order details, product details, customers details anywhere and anytime with help of their iOS devices. This extension eliminates the need to login from PC to get detailed information of the happenings in online stores. Sometimes, due to some technical issues, server related problem, or if you want to change some feature or theme of your live website, you require putting your site under maintenance mode. At that moment, Easy Site Maintenance extension is a boon for online merchants. Easy Site Maintenance Extension allows you to put your online store in maintenance mode for specified period of time from the frontend and configure it from the backend. Manufacturer Brand Logo Pro allows you to upload the brands logos of your products. Now you can manage brand logos of your products from the admin side. These logos integrate effortlessly with your online store. This allows the users to enter their billing address. If they want to keep the billing and shipping address same then they just need to select the “Ship to the Same Address” from the check box or else select “Ship to Different Address”. Move your products from cafepress to Magento store effortlessly! Yes, this is the objective of our easy to use configure Cafepress extension. You can now flash important notifications and campaigns on your Megento e-store effectively by displaying it on the top, bottom and in the form of pop up on each page of your website. Simple and easy way to inform your customers about something specific you want to convey! It is equipped with multiple features to have easy control on it! Give your customers a quicker and filtered search results. Help them search product catalogue faster with relevant attributes! Help them get an improved shopping experience! Retain and acquire more customers! You can display your products, images and other details in different types of files that can be uploaded now for showcasing your products in an appealing way. Advance Product File Upload extension allows you upload any length and type of files to attract more customers. Card Design Tool to create personalized designing cards as per customers want. Gift Product Design Tool for Magento store where your customers personalize & customize their gift products like mugs, photo frames etc. Skin Design Tool for Magento online store where your customers can design their mobile & laptop skins and give it a creative looks. Easy to Configure : It can be configured to your Magento store easily! It will simply require you to follow some predefined steps. Admin can Assign Authority to Others : In addition, it’s not only admin that can handle the task of deleting unnecessary order comments but the right to delete comments can also be assigned to any other user, having access to backend. Relevant Details of Deleted Comments Available : All the relevant details of deleted comments can be viewed including order Id, name of the person who entered comment, order status when it was deleted, and its created date! Now inform about any sale or discount in your products to your customers through Product Sale Alerts extension. All your customers, who have subscribed to this option, will receive an email about the current discounts on various products of their choice. Looking for a secure solution to manage those huge stocks? Here is a robust, feature rich yet safe application that controls the stocks and orders efficiently. MageMob Inventory is all new Magento application which helps suppliers with the management of stock order status, shipping costs, purchase orders and goods received. With the help of MageMob Inventory app, suppliers can accomplish customers’ orders within the defined time. From mobile, users can perform below tasks using this app. Whereas, from web users (admin) can have below key features! 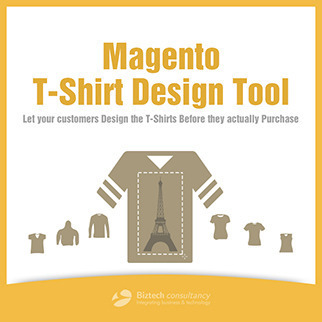 Brush Your Ideas, a Magento extension come online product design tool has been developed to make buyers innovative and offer creative product customization solutions. The product is paired with robust features and advanced specifications which give buyers a blissful online shopping experience with a number of products to choose from. Buyers can design T-shirts, Mugs, Covers of Mobile and Laptop, Business card, Greeting Cards, Posters, upholstery and the list is endless! Users can use artwork options like phrases, text, clip-art images and many more alternatives to design products of their choice. They will have various templates to choose from and then they can customize the product in their own day. And customizing these products is as easy as it can get. Your customers can simply select a product from your store and start designing by adding their own text with various effects like curve & shadow, or add their own images and clipart and edit them. They can also use the brush tool to create their own designs and patterns. And if they don’t want to get into the details of designing, they can simply select one of the many awesome design templates added by you in your store and customize them as they like. Integrate Australia Post Shipping to your eCommerce store for domestic and international parcel shipping! Easily set shipping handling charges, flat rate, etc on your own. Boost the online shopping experience of your customers. Australia Post Shipping provides a great opportunity to online store owners to help customers with enhanced buying experience. Magento Gift Promotions on Cart Total extension has been developed to help merchants to display gift and promotional products on their e-store on a certain Cart Total (Purchase Price)! On reaching a certain purchase price range, these promotional products would be visible to your customer and allow them to proceed for purchasing. It gives you the liberty to display the promotional products only to exclusive customers who purchases products that exceed certain price slab, as defined by the admin! Displays Promotional Products in frontend - You can display the promotional products in the frontend of your e-store in the cart page. Manages Promotion Price - It retains the predefined price range of purchase set by the admin, crossing which the customers would be able to view and select the promotional products. Displays in Cart Page or Checkout Page - There is provision for the admin to decide where to display the promotional products – on Cart page or directly on Checkout page in frontend. Works for Multiple Stores - This extension can be installed and managed for multiple store, given specific need and choice of the store owner. Point of Sale can help you go through the entire process of placing order to checkout from anywhere anytime without having to access your system. It can help you create orders on behalf of your customers using your iPad/Android Tab anywhere, in your go also! Mage Mob Admin is a combo package of Magento extension and mobile app using which you can manage your Magento store back end directly from your mobile or tablet. Mage Mob Admin app is available for both android and iOS devices. With Mage Mob admin you can get new order notifications, check order details, track order fulfillment, manage products and customers and get reports for all store transactions and sales. Looking for an advanced solution to manage customer delivery schedules? Here is a robust, feature rich yet safe magento extension that manages the customer delivery schedules efficiently. Delivery Date Scheduler is all new Magento extension which helps e-commerce store owners with the management of delivery time slots, disabling particular dates for delivery, managing rates for particular day & time slots. With the help of Delivery Date Scheduler extension, store owners can allow customers to choose delivery time according to their availability and satisfy the most demanding customer need of flexible delivery.